On December 31, I was running around like a lunatic. Doing my nails, finishing up work, writing down my resolutions and texting people to figure out plans, all in hopes of starting 2014 right. 2014, I decided, would be my year. 2012 was one of the most tumultuous of my life, 2013 was a year of recovery and growth, and 2014 was devoted to achieving extraordinary things. I was determined, and I was determined to wrap up all of the loose ends of 2013 on December 31 so that nothing could hold me back and I could start the year off running. I woke up on January 1 feeling great. Ready to take on the world. So I did. I started gathering recipes and making plans for my Whole30 challenge that I was to start the next day. I went to two different grocery stores to get my ingredients, and prepped for hours. And I was off. Ready to take on the world, one Larabar at a time. I reminded myself of all these things for a month, and proved to myself that I am capable of taking on the world. I trained with my personal trainer, stuck out all 30 days of the Whole30 (okay fine, I have three more meals! ), cooked dozens of meals, kept organized with my work schedule and personal schedule, contributed as a member of a startup team, had a weeklong successful work trip to Miami, didn’t have a sip of alcohol (because of the Whole30! ), took a Skillshare class, found a new office for my team, and took on my first branding client. I made sure to keep in touch with friends and to filter out the energy I didn’t need around me. I avoided dating so that I could focus on myself and what makes me happy without the distraction of adjusting to someone else’s needs. I spent time with family. I booked a trip to Peru for April. I started implementing Friday “personal workdays” where I can focus on tasks and projects I am working on outside of my job description (I am fortunate to work a four-day work week at my day job!). Overall, I got things done. January was one of the most productive and empowering months of my life, and I believe it was all about the framing. I went into 2014 with a positive, can-do, ready to take on the world attitude. And that’s what I did. I believe you can do the same if you set goals and actually believe you can. I can’t wait to see what’s in store for the next 11 for me and all you troublemakers. Let’s make 2014 a year of productivity towards ourselves and the world. Are you in? I could NEVER live without chocolate! Actually, you CAN! You will live if you don’t eat chocolate for 30 days. Isn’t that crazy? Okay, so I know that perhaps I am already more health conscious than others, but doing the Whole30 just ain’t that bad. Yes, it requires planning. A lot of it. And it also requires a lot of time in grocery stories and cooking in the kitchen. But what you end up with is 30 days of pure, whole, real food. It’s empowering to know you CAN live without pasta, cheese and chocolate (I know, that isn’t easy). It’s empowering to know you can control your eating habits and not being influenced by others who are tempting you with mac and cheese goodness. The “I can’t” phenomenon I’ve observed isn’t just around eating. I hear it about careers (“this is my dream job but I don’t have the perfect background, so I can’t apply”) and dating (“I can’t bring up if we are exclusive, it’s too scary, what if he ends it?”) and fitness as well (“I could never run a marathon), among others. And I am not claiming to be immune from it either. By living in a mindset of “I can’t,” I feel we are holding ourselves back and not letting ourselves reach our highest potential. We need to constantly be challenging ourselves, and pushing ourselves to the limit to achieve our goals and inspire others to do so as well. One of my 2014 goals is to take on a project that challenges and even scares me (more on all my 2014 goals coming soon!). I challenge you to do the same. To take on a project at work, a new healthy lifestyle, a fitness class, or something educational that you have wanted to try but some part of you is holding back. My troublemakers, how can we cause necessary trouble if we aren’t willing to take on big challenges ourselves? By resisting chocolate for 30 days (and trust me, that’s no easy feat for myself), I am empowering myself to tackle real challenges, to know I am capable of doing things that used to be my “I can’t”s. And to me, that’s an “I can.” How are you going to challenge yourself in the next week, month, and year? -Reverend Martin Luther King, Jr. Wise Words from Martin Luther King, Jr.
Last week when I launched my blog (thanks to all of you who read it so far! ), my friend Jenny emailed me with the idea of cooking together. I was very excited because Jenny and I are always talking about healthy living and exchanging recipes, but Jenny doesn’t cook much. She asked me to come over so we can cook together and she can learn the ropes. I gave her some tips along the way, and I included some here too. Of course I took her up on it! I have been cooking a TON because of the Whole30 detox program I am doing (I can only eat proteins, nuts, fruits and veggies, no juice cleanses over here– more to come on that) so it was nice to have company. Everything we made is Whole30 compliant. We did triage and decided to start by making the veggie broth for our soup, because that takes a while to simmer. 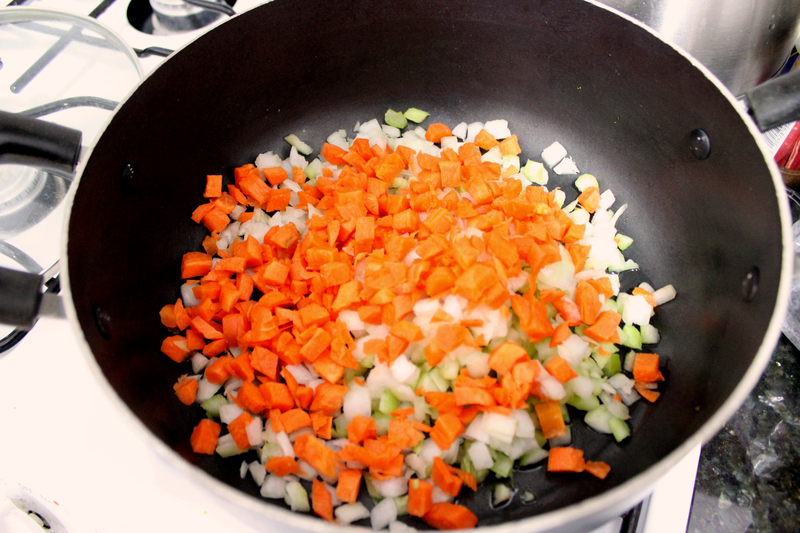 Luckily we bought a mirepoix at TJ’s so we didn’t have to cut up all of our carrots, onions, and celery. Tip one: Save time and make things easy for yourself! If you can buy precut and it’s reasonably affordable, do it. It will make your life so much easier. So we added our mirepoix to a pot, sautéed for a few minutes, added water, let that simmer for a while, then eventually added the broccoli and cauliflower, let it boil, and blended it all up with my immersion blender. 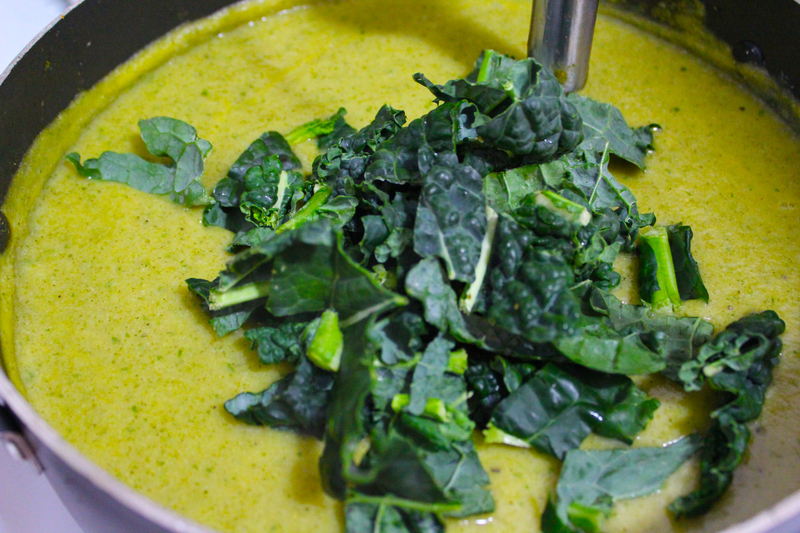 We had some kale lying around, so Jenny threw that in– why not get even more greens? You could barely taste the kale anyways. We also got started early on the marinade for the chicken, so that could mariande for a bit. Jenny blended up some cilantro, mustard, lime, salt and pepper, rubbed in on the chicken and got that started. After about an hour we baked the chicken for 30 minutes to perfection. I recently had an amazing salmon burger at Siggy’s Good Food which I wanted to try to recreate. I found a recipe online which required putting everything in a blender (weird, I know), so that’s what I did. Blended up the salmon, basil, some cashew flour, spices and an egg. Then pan fried them. Unfortunately these didn’t turn as good as Siggy’s, but they were still enjoyable. Tip 2: Improvise with what you have and what you like. The salmon burger recipe I found didn’t include fresh herbs, but I love basil and we had some extra, so I threw some in. Be creative! You don’t have to follow recipes precisely. 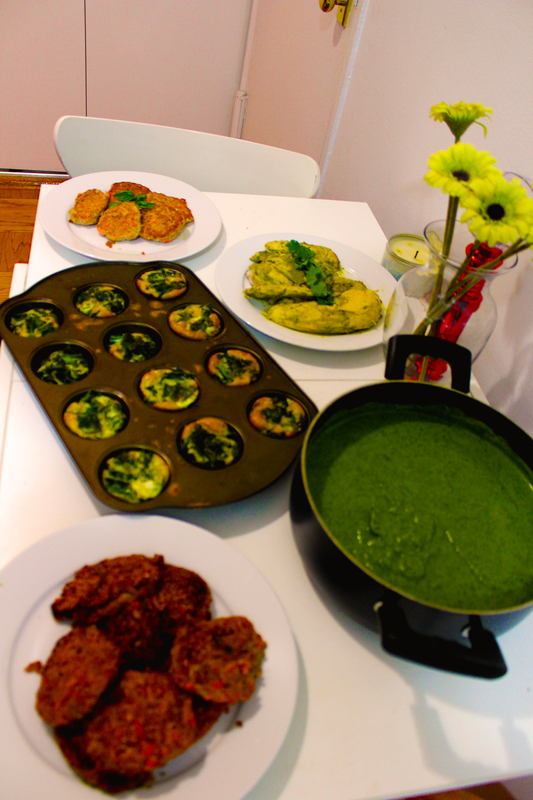 Lastly we also made super easy egg kale mini fritatas in muffin tins (just mix up some eggs, salt, pepper, throw in some sautéed kale, pop in oven at 350 for 25 minutes) for quick, on the go breakfasts, and some sweet potato carrot ginger cakes from Live Better Forever. I probably should have followed the recipe closer, but they still turned out well! Tip 3: It’s easier to cook and eat healthy with friends. Jenny and I had a really good time. We accomplished a lot cooking, made some great food, and got to know each other better. For example, I learn that Jenny roasts her own almonds– 10lbs at a time! Needless to say, they are quite delicious. Do you prep food on the weekends for the week? What are your tips? Let me know in the comments (top left of the post)! Yesterday I had the pleasure of kicking off the fellowship I run, PresenTense NYC, with a new cohort of 12 passionate social entrepreneurs. I am one lucky gal– who else gets excited to check work email? Can’t wait to see where this journey takes them. PresenTense NYC Kickoff On Sunday! When my younger sister graduated from Union College in June, I had the privilege of hearing civil rights leader and U.S. Rep. John Lewis convey his message to the graduating class about taking action, just as he so bravely did 50 years prior. Sitting in the rain, I promptly pulled out my iPhone and registered the domain necessarytrouble.com. What better way to describe the work I was interested in? I loved Rep. Lewis’ message to the students, and it’s a mantra I try to live by. I try to inspire good, necessary trouble to help people understand their obligations to themselves, their communities, and the planet. The truth is, I have always been a troublemaker. Constantly reminded by my wonderful parents (hi mom & dad!) that I didn’t outgrow the terrible twos until middle school, I have always seen the world out through a “heck no to the status quo” type of way. I think life is worth living in a way that makes sense to you and not the way that is predefined by anyone else. If you are unhappy with something, change it. If something isn’t working for you, come up with a solution. Be a troublemaker. It pays off. So I am starting a blog about it. This may be a “typical” blog about a “typical” 20-something living in New York City, trying to build a career, find the love of her life, living out of a shoebox apartment, eat healthy, travel the world, take photographs, and find awesome people in a city full of so many it’s hard to know where to start. But it’s my story, and when I tell it, I hope it won’t be so typical. It’s just me, who I am, and what I believe. I may write about my work with people who are starting businesses to change their communities and the world, I may write about healthy eating and living. I may write about social media, photography, or my love of Borat. I may write about the fabulous book club I am a part of, or the struggles of finding love in an overworked, overcommitted, and over saturated city. I may rant about consumerism and our role in creating a more sustainable planet. Or how diet soda is bad, and soy is worse, and how you should always make sure your instagram and twitter handles match for easy cross posting. I love chatting about entrepreneurship and the startup scene, the best apps that belong on your iPhone, and the best brunches you can find. And I may feature friends and colleagues who you shouldn’t miss out on. Only time will tell where this goes. So these are my words for what they’re worth. Let’s make some trouble– necessary trouble.